where rp is the vector from the center of the Earth to the point P, r3p is the component of rp parallel to the Earth's spin axis, and Rm is the equatorial radius of the Earth. The gravity-gradient matrix becomes particularly useful for spacecraft that have long appendages or that are highly asymmetrical. where the subscripts M, S, E, and V denote Moon, Sun, Earth, and spacecraft, respectively, and rMV is the vector from the Moon to the spacecraft. Solar radiation includes all the electromagnetic waves emitted by the Sun, from X-rays to radio waves. Solar wind is the particulate radiation expelled from the Sun and consists mainly of ionized nuclei and electrons. Both solar radiation and solar wind may produce torques which affect the spacecraft attitude. The charged particles and the magnetic field embedded in the solar wind may also affect sensor performance or ground-spacecraft communication. For most applications, torques due to solar radiation pressure will be much larger than those due to the solar wind. Torque is proportional to the momentum flux (momentum per unit area per unit time), and the solar radiation momentum flux is two to three orders of magnitude greater than that of the solar wind. Furthermore, the solar wind does not penetrate the Earth's magnetopause (see Section 5.1) except in the vicinity of the magnetic poles. where 1358 W/m2 is the mean flux at 1 AU, and the denominator is a correction for the true Earth distance. D is the "phase" of year, measured from July 4, the day of Earth aphelion [Smith and Gottlieb, 1974}. This is equivalent to a mean momentum flux of 4.4X10-6 kg-m-1 -s"2. Variations in this flux from this formula are always less than 0.5%. 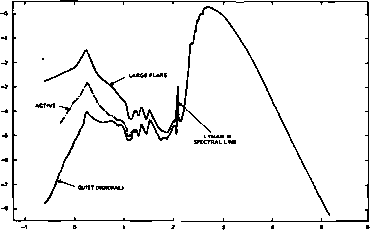 Solar radiation is largely emitted in the visible and near-infrared portions of the spectrum, as shown in Fig. 5-9. Note that the three curves coincide for wavelengths longer than 14 nm. The solar wind was first postulated to explain the aurorae, geomagnetic disturbances, and the bending of comet tails, and was first observed directly by the Russian Luna 2 spacecraft in 1959 and Explorer 10 in 1961. 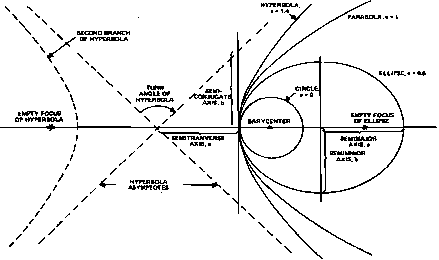 The solar wind is coronal gas ejected from the Sun by a process that "can be deduced only by true believers, usually with a parental relationship to one of the competing ideas or models" [Hundhausen, 1972], Its composition is typical of that of the corona, meaning that the relative abundance of elements is essentially solar, with hydrogen dominating, helium being second most common, and all other elements two or more orders of magnitude less abundant. For a table of solar abundances, see Allen . The solar wind is ionized virtually completely at least to a distance of 5 AU or more, with the ionization state of the elements being those that would be expected from a 1.5 X 106 CK gas (i.e., nearly all electrons with binding energies less than 130 eV are stripped from their nuclei). Table 5-7 lists some properties of the "quiet" solar wind at 1 AU in the ecliptic plane.